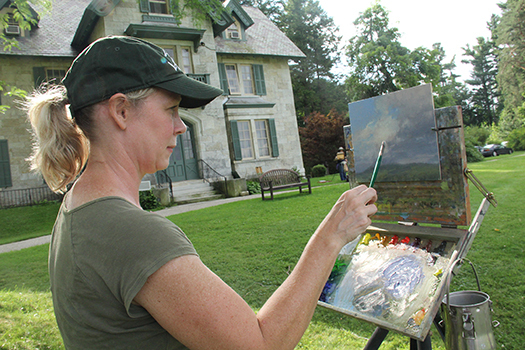 Stockbridge, MA, September 1, 2017—Norman Rockwell Museum will present In Plein Air: An On-Site Painting Event on Saturday, September 16, from noon to 4 p.m. Visitors are invited to join illustrator Dan Howe for an outdoor painting event inspired by the Museum’s scenic 36 acre site, which includes views of the Berkshire Hills, Housatonic River, and Norman Rockwell’s studio. The day will begin at 12 p.m. with plein art painting demonstrations, followed by an opportunity to create your own work of art onsite from 1 to 4 p.m. A reception and showing of artworks will follow. Admission to the afternoon workshop costs $25, $15 for Museum members. A materials list is available upon request. Pre-registration recommended by calling 413.931.2221 or email@nrm.org.